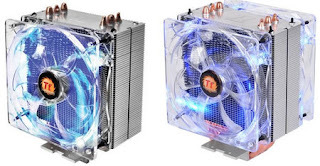 Two new Contac 39 and Contac 30 CPU cooling fans have been rolled out by Thermaltake. The CPU fans are compatible with all Intel and AMD chipsets and support Intel Sandy Bridge-E Socket LGA-2011. As the CPU fans have come out with an improved curved aluminum heat sink and a trio of 8mm Æ heat pipes, you can have a better performance from your chipsets. Another important feature is that there is also a low noise 120mm PWM fan that automatically adjusts the fans’ speed between 800~2000 RPM according to the system condition. Unfortunately, there is no information about pricing and other details. However, it will be posted soon. Keep visiting us.